Little Mustard Shop is a small independent boutique selling the work of artist Sam Toft. Sam, who lives locally, is an internationally recognised artist whose work is widely published. You may recognise her characters, Mr Mustard, his dear lady wife Violet, and grumpy, portly Jack Russel terrier, Doris, as her prints and posters have graced the shelves of Ikea, Next, Home Sense, B&Q, as well as hundreds of outlets across America, Europe, Australia and Japan. Her annual one-man solo shows at Pall Mall, Battersea and in the Cotswolds are keenly anticipated. Her latest venture is the dear little Mustard Shop on Clifton Hill, Brighton. Here you can peruse exclusive gifts from £2 to £1000, including original work alongside mugs, books, calendars, cards and kitchenware. Twice yearly events, in December and May, find Sam herself in the store, drawing pets and signing the latest copies of her books and catalogues. 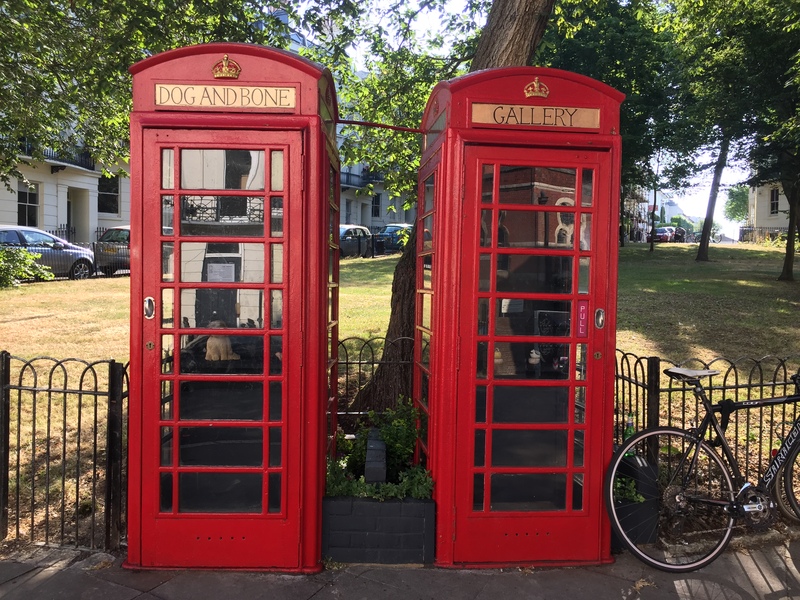 Around the corner, in Powis Square, are two phone boxes lovingly restored by the Little Mustard Shop and run as a free community gallery space. Dog and Bone accepts proposals from artists far and wide. Curated by fellow artist Cadi Froehlich, there’s a monthly display of varied and interesting art, currently on the theme of dogs and phones! Sam Toft art fan–so happy to read your article here in Washington State, USA!